In this new era with many global competitors, survival of the fittest has a new meaning. Only those organisations who can adapt and change quickly enough will survive. Global developments such as oil prices, terrorism or politics, create new dynamics forcing companies to adapt. Even more, new technologies such as Cloud, Big Data and Mobile are changing the world so fast that even regulators cannot keep up. Organisations are in a continuous mind of change; those who don’t, struggle in their existence. So, what’s the struggle? While things have changed over the last couple of decades, there was certain stability as well. The Cold War lasted about 45 years and it’s only recently that the US government is lifting its Cuban embargo after 50 years! Change doesn’t happen quickly! The same is true for our office – most people still favor their own desk and work from ‘9 till 5’. We have always been taught to plan our lives as well as stepping in our parents’ footsteps (education -> work -> marriage -> house -> kids & dog -> retirement). The same is true for project management. 2) The ability to change and adapt is reduced significantly after project start, requiring Change Orders for new or changed requirements or technological capabilities. To give you an example, there was this large bank who wanted to ‘go mobile’. Customers were asking for a new way of banking as they had busy lives and were not able to spend a few hours in a branch. And in addition, banks needed to reduce operational costs. So they set out to define requirements, which was difficult because at that time mobile technology was new for all of us. But hey, they produced a huge document which got signed of buy someone who had no idea how it actually would work. Of course there were steering committee meetings during the development cycle, and they discussed delay after delay. Apparently, the bank’s IT landscape was not capable to handle new technology (no Service Oriented Architecture, no consistent data model, impossible integrations, etc). At the end of a 1.5 year project cycle, they launched the new mobile banking app. Guess what? 2) Keep things simple, small, manageable. 3) Keep things flexible and allow change. 4) Be transparent and get your customers involved. 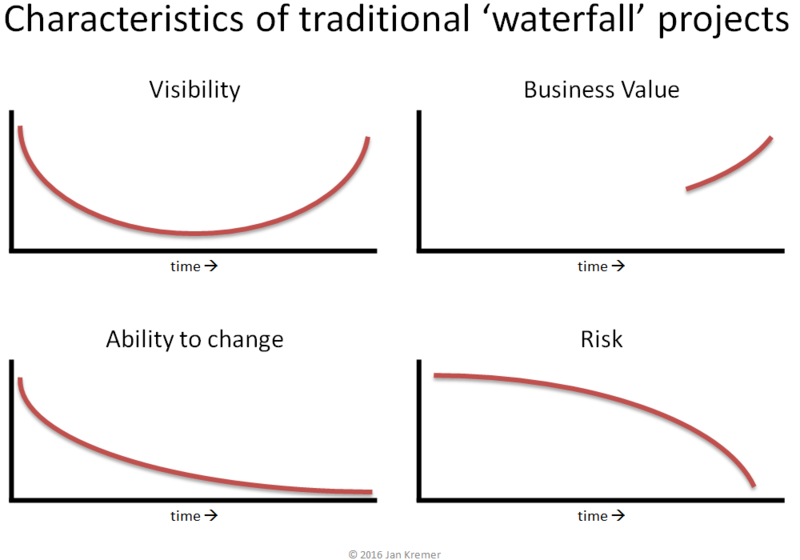 In a world where change is the only constant factor, a traditional ‘waterfall’ project delivery approach does not work anymore. New delivery models are required, and you could argue that is true both in a corporate world as well as in one’s personal live.